There is often great debate as to whether or not to add an external filter to a Triumph (or BSA) and what to run in them for engine oil. Many purists think it approaches sacrilege to add a filter because "They weren't designed to have external filters" and/or "If you're going to own an old Brit Bike you need to be man enough to split the cases at the recommended interval and clean the sludge trap." Oddly enough, many of those same purists will hurry up and ditch the Lucas electrics for modern solid state parts and/or update the clutches to more modern parts. I'm not entirely sure how that all works. I do know a little bit about oil and filters, though. So, should you add a filter to your classic Brit bike? And what should you run in it for oil? Those decisions are yours to make but I will give you some information that may help you make those decisions if you have the time and the inclination to read through it. When the Triumph engine was designed there was no detergent motor oil, which is crucial to this discussion. Detergent motor oils aren't just meant to clean. Their greater purpose is to hold contaminant particles in suspension until those particles are filtered out by a media type filter. Early internal combustion engines were designed with areas inside the engine where the oil would pool, allowing contaminants to "settle out" of the oil. This is why, when one disassembles an old engine that has run non-detergent motor oil, there will be large pockets of sludge. This can also be a huge factor in carbon deposits on the tops of valves. Triumph's sludge trap was very innovative and a wonderful advancement... for the time. It used centrifugal force to remove many of the contaminants, like a centrifuge. The problem was, and is, that if it isn't cleaned in time that sludge trap will eventually fill to the point of no longer providing any filtration whatsoever or possibly restricting oil flow and neither of those is a good thing. Another problem that I see and hear fairly often is that a guy will obtain a classic Brit bike and then start to run detergent motor oil in it without going through the engine, cleaning the sludge trap, and adding a modern, media type filter. This is a really bad idea, for two reasons. The first reason is that detergent motor oil may "break loose" existing sludge in the engine, clogging an orifice or doing other damage by its abrasive nature. The second reason is that even if it doesn't break loose existing sludge, the detergent oil will keep the particles suspended, just as it's designed to. Instead of settling out, those abrasive contaminants will continually circulate throughout the engine, greatly reducing engine life. ﻿﻿The ONLY way it is safe to run detergent motor oil in something that was originally designed to run non-detergent oil is to start with a fresh engine that has been meticulously cleaned, including the sludge trap, and to add a modern type filter to it.﻿ If the preceding criteria are met, detergent motor oil and a quality filter will provide much greater protection throughout the engine, extending its service life almost exponentially. You can absolutely add a modern filter and still run non-detergent motor oil. The filter will still catch most of the particulate matter. It may or may not get it all but it will get most of it, and whatever it does catch won't end up in the sludge trap or elsewhere. I personally can't see how that could ever be a bad thing. The rule of thumb when dealing with new engines, such as lawnmowers for instance, is this. If it has a filter, it uses detergent motor oil. If it has no filter, it runs non-detergent oil. But let's get back to your classic Brit bike; by the numbers. An external filter is not absolutely necessary but it will reduce engine sludge, even when used with non-detergent motor oil. Detergent motor oil should ONLY be used in a fresh engine that has been thoroughly cleaned, including the sludge trap, and has been fitted with a modern type filter. If you're starting off with a fresh engine that has been meticulously cleaned, including the sludge trap, adding a quality external filter and using detergent motor oil will provide much greater protection throughout the engine and extending its service life almost exponentially. Adding a modern filter is even more beneficial in the case of unit construction engines, where the engine shares its oil with the transmission and primary drive, picking up debris from worn clutch plates, clutch basket, and sprockets. An external filter should ONLY be plumbed into the pressurized return line that brings the oil back to the oil tank. 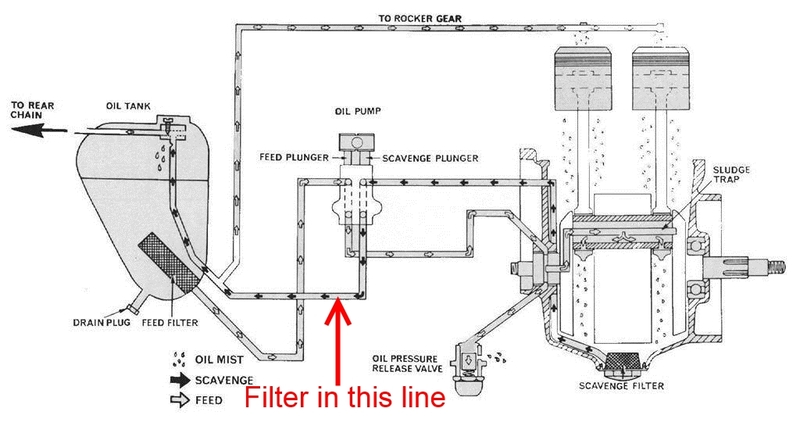 It should NEVER be plumbed into the gravity fed supply line between the oil tank and the oil pump, even though the stock mesh screen is at the supply line. Gravity cannot be counted upon to force the oil through the filter once it starts to get dirty. Please see diagram below. You want a very free-flowing filter as these bikes don't make a lot of oil pressure, especially on the return side. Filters for Harley-Davidson© Evolution© engines are a generally good choice as they filter in the return line, from the factory, and are also of relatively low oil pressure. All of our remote filter mounts use a 3/4"-16 thread, which is the most common size. If you do decide to run an external filter, even from someone else, you'd want one with that same thread. In summation, an external filter is not an absolute necessity. Your classic Brit bike can function just as it was intended to without adding a filter; but it can function better than it was intended to if you do add a filter; and it can function much better if you start with a perfectly clean engine, including the sludge trap, add a quality filter, and run detergent motor oil. By better I mean much longer service life for the engine and greatly extending the service interval for the sludge trap. I personally wouldn't run anything without a quality oil filter in place and I'm of the opinion that you shouldn't either. If you don't care for any of our offerings, there are many other quality parts out there. I'd rather see you run someone else's than to see you run nothing at all. If you'd like to discuss it further, please feel free to email me at dan@mooresensible.com or give me a call at 262-331-3303. I'll do my very best to answer any and all questions that you may have and I promise that I'll only give you honest, straight information with no sales pitch.